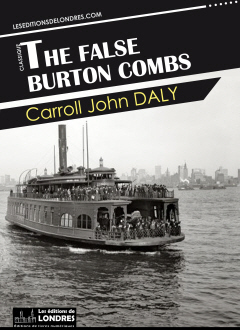 “The false Burton Combs” is a crime story (“hard-boiled”) written by Carroll John Daly and published in the “Black mask magazine” in December 1922, therefore predating the first appearance of Dashiell Hammett's the Continental Op in October 1923. “The false Burton Combs” is a must-read story for anyone interested in the genesis of hard-boiled, or in crime stories. It is also simply a good story, which reunites all the elements that will become the founding blocks of American detective novels, private-eye stories and hard-boiled in the coming years which Hollywood, with the help of some émigré German film directors, will then turn into an unassailable legend: the film noir. The narrator is being followed. The man who follows him asks whether he can stay in his room on a boat. They talk; he asks the narrator to impersonate him on a trip to Nantucket, as he is afraid he might be murdered. The name of the follower is Burton Combs. The narrator then goes off to Nantucket and he gets to know different people. There's a widow, there's the young Marion St James. Then he sees them: three weird-looking men. They first try to shoot him, and Marion is injured. They try again but he avoids them. Finally he falls into a trap set by the widow. The three men (including a dubious individual named Farrow) take him to the moor. Later, when they're about to shoot him, his hands get a hold of a gun, and he kills the three of them. He is arrested shortly after that, and soon trialled. At the last minute a surprise witness comes to the bar; it is Marion, she was hiding in the car when everything happened. The hero/narrator is acquitted. He is offered a job by Combs the father and he marries Marion. As we said, “The false Burton Combs” is the first hard-boiled story. Some say that the next Daly, “Three-gun Terry”, featuring the quintessential private eye, Terry Mack, deserves the honour of being called the first hard-boiled novel, but this is not historically correct. “The false Burton Combs”, with his kind of anonymous, tough-guy, hard-boiled style, is the first one, sometime towards the end of 1922. Then other Daly stories will follow, and then Erle Stanley Gardner, and of course Dashiell Hammett, Raymond Chandler. So, hats off, and let's discover this enjoyable short story. December 1922 is the product of three major circumstances in the history of the United States. First, there is a post-World War One crisis, starting in 1920, which hits the United States particularly badly, leading to a jump in unemployment from 4% to 12%, whilst gross domestic output declined by 17%. So, nine years before the financial crisis which would lead to the Great Depression, the Roaring Twenties started with a very bad crisis which had a real impact on everyday people, and as always in the United States, had led to a surge in crime and people ready to do anything for something. Second, at roughly the same time starts the Prohibition, which offers many ambitious crime bosses the opportunity to build extraordinary fortunes through the illegal manufacturing and bootlegging of alcohol, and to young disenfranchised men, the possibility to make a buck. Third, 1920 is the year that the United States becomes an urban majority country, i.e. when the urban population passes the 50% bar. This is also when the Western stories definitively give way to the urban crime ones: the hard-boiled novel is born. Even the best works of literature need great vehicles. This is what the Black Mask did for popular American literature. It was created in 1920 by journalist H.L. Mencken and drama critic George Nathan, and was originally launched to supply some well needed cash to a more high-brow literary magazine, “The Smart set”. It quickly became a success, and reached its high point in the 1930s, after which it began its decline. The Black Mask, originally started as a money-making publishing venture: not specialised in crime stories but basically looking for easy reads that people would want to pay for, was not about finding great new writers or inventing a new genre, it was about making money. It made money, but only for two decades or so and by doing so, it allowed some of the greatest crime writers ever to make a living and be known. Colloquial, colourful language: the hard-boiled, a genre quintessentially American, introduces the spoken language into literature, formerly dominated by European principles. Hard-boiled also invents those colourful images taken from real life, and from the street. Underworld: the private-eye is the eye of the reader; the true hero of the hard-boiled novels is the underworld, with its cortege of pimps, sultry ladies, gun slingers, corrupt cops etc. Strange encounters: the hard-boiled novel is a world of open doors; it is a romantic descent into the Underworld where paradoxically everything is made possible by the circumstances. The night: the hard-boiled belongs to the night. The night is the constant background of the story. And one could argue that a film noir can be recognised through its lighting, shadows and shades set against the starry night, and the city lit at night. Philosophical observations about life and death: the hard-boiled hero always aims to elevate himself. Officially minding his own business, he is in reality desperate to find meaning to what he does, and constantly looks for “the stuff that dreams are made of”. Life in the hard-boiled story: cigarettes, alcohol, being knocked down, constant lack of sleep, one-liners, this is the daily life of the hard-boiled hero. Femme fatale: women are mysterious, dangerous, irresistible, smart and mischievous; they are part of this incredible world where the hero, i.e. the reader himself, falls into a state of day-dream. After all, the film noir or the hard-boiled are an artistic rendition of the sexual craving that man wants to satisfy in a new, complex and urban-romantic world. The femme fatale is like a beacon blinking in the city at night, with the hero sailing to set his hands on her, whilst knowing that her conquest would signify his own death.